What does an area chair do? The duties of an area chair include creating and sending out Calls for Papers (to related listservs, academic departments, contacts in the field, etc. ); receiving and reviewing proposals through the conference’s submission database; and forming worthy proposals into thematic sessions (also using the database). Area chairs do not have to chair all of their sessions themselves, but can ask their presenters to do so. Area chairs act as a liaison between their presenters and the conference organizers, provide their presenters with updates of current information, and serve as their subject areas’ representatives at the conference each year. What are the benefits of being an area chair? Being an area chair represents significant service for your profession and/or area of interest. Besides being a rewarding experience, area chairing is a valuable activity to list on your CV. The position also provides you with an excellent opportunity to network within your field. Also, area chairs get a discount on conference registration. How does the conference find new area chairs? The conference staff generally finds new area chairs in several ways. When an existing area chair decides to leave, s/he often recommends a former presenter as a potential replacement. The Area Chair Coordinator may also solicit recommendations from current area chairs or email presenters, asking for applicants for open areas – either existing areas whose chairs are leaving or new areas that the conference would like to start. A presenter may also contact the Area Chair Coordinator with an idea for a new area that might fill a gap in the conference’s listed subjects. Those interested in chairing an open area or a new area should email their CV, area(s) of interest, and any other relevant information to the Area Chair Coordinator, Kathleen Lacey, at klacey@southwestpca.org. Who qualifies to be an area chair? Generally, an area chair needs to be a faculty or staff member at some type of educational institution (a school, museum, library, etc.). Most area chairs are PhDs, although some are MAs who are academic professionals. The conference wants area chairs with expertise/experience in their subject matter, professional stability, and networking ability. Area chairs also need to have the time and ability to perform the required duties and attend the conference every year during their term as chair. In the past, the conference did sometimes allow graduate students to serve, as area chairs; however, in recent years, that conference policy changed, and only graduate students who complete the Michael K. Schoenecke Leadership Institute Fellowship Program are eligible to serve as area chairs. How long will I be an area chair? The organization expects new area chairs to serve a minimum two-year term, although most area chairs serve much longer. Yes. As an Area Chair, you are expected to attend the conference every year, except under last-minute, unforeseen, emergency-type situations. The executive team does make occasional exceptions to the rule, but such exceptions are rare and would need acknowledgement and approval well in advance. (Ongoing financial issues do not generally qualify. In the current economic climate, we understand that many area chairs are dealing with financial issues regarding travel funding, etc., and we greatly appreciate their dedication in attending year after year despite such difficulties.) 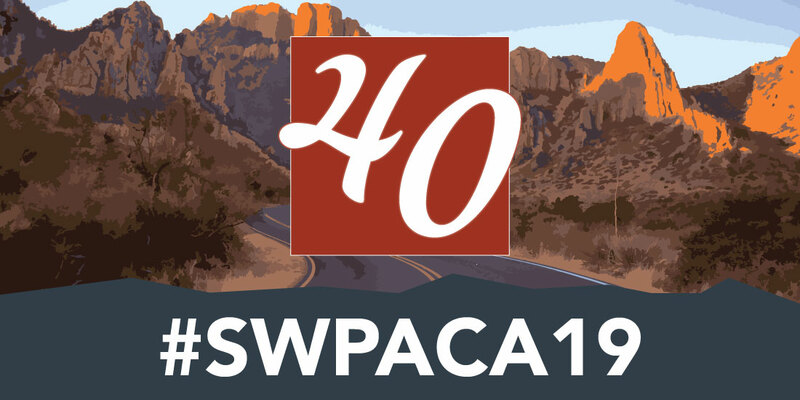 If, as the conference nears, you find you cannot attend the conference, immediately contact the Area Chair Coordinator, Kathleen Lacey, at klacey@southwestpca.org. Also inform your panel chairs and presenters about your absence (and, if necessary, find panel chairs for the panels you would have chaired yourself). Can I have a co-chair? Although co-chairs were a part of the conference in past years, due to various difficulties, SWPACA phased them out as existing co-chairs left. The only exception is for Michael K. Schoenecke Institute Fellows, who serve as Assistant Area Chairs during their first year in the program. The conference uses a standard CFP for all areas that includes general information about the conference, submission procedures and requirements, student award opportunities, deadlines, and special events. The Area Chair Coordinator will send out this template prior to the opening of the submission database, and you will be responsible for including a description of your area as well as any specifics about the topics you may be seeking. In their descriptions, most area chairs often list several ideas for presentations, though most are all-inclusive. Though we only include the description on our website, area chairs use the template to post their CFPs to various websites or in emails to colleagues. See the Calls for Papers page for examples of area descriptions. >Where should I post my CFP? Social networking is another way to spread the word; you can use Twitter, Facebook, LinkedIn, blogs, or YouTube. For examples, see what the Science Fiction and Fantasy area’s co-chairs have done at www.facebook.com/swtxsff and at http://twitter.com/swtxsffchairs. They even created two CFP videos for the area on YouTube: http://www.youtube.com/watch?v=_idNQNhZYek and http://www.youtube.com/watch?v=BDgTEofJYJs. How do I use the database to receive and deal with proposals? Once the database is ready to receive proposals each year, conference staff will email all area chairs with instructions on how to log in to the database and accept/reject proposals. Then, whenever an applicant submits a proposal to your area, the database will automatically send you a notification email containing the proposal’s title and a link to the database. When logged in to the database, you will see all proposals you have received and their status (submitted/accepted/declined). Through the database, you will be able to accept or reject each proposal – and, later, to form your accepted proposals into thematic, titled panels (with 3 or 4 presentations each). How should I evaluate proposals? Area chairs are responsible for vetting proposals according to relevance, merit, the scholarly standards governing their fields, and various other factors. Area chairs are also expected to accept or reject proposals within two weeks of submission. Do I need to create my own acceptance and rejection letters to send to applicants? Not anymore. Now, whenever you use the database’s accept or reject functions for a proposal, the database will automatically email that applicant a standardized letter of either acceptance or rejection. What should I do if an applicant emails a proposal instead of submitting it in the database? Email the applicant to say that you received the proposal but that you will not review (or accept) it until it is in the database. Ask the applicant to put the proposal in the database ASAP. Then, utilize the database’s accept/reject functions; do not solely notify the presenter through email (although feel free to send an email notification as well). Can I ask an applicant to add, clarify, or edit anything in a proposal I received? What if I receive a proposal that would fit better in another area instead? How soon do I need to notify applicants of my decision? How should I create my area’s panels? Once the submission deadline passes, using the database, you will move your accepted proposals into panels of three or four (optimally four) presenters each. Whenever possible, each panel should be organized around some sort of theme. To help attract an audience, the conference strongly encourages all chairs to give their panels individual titles based upon those organizing themes. For instance, in 2011, a Music panel was titled, “Deconstructing Performance and Performers.” You must also give each panel a number (such as Music 2: Deconstructing Performance and Performers). Please use numbers, not Roman numerals. The order in which you number your panels is the order in which they will appear on the conference schedule. Can I accept full, pre-created panel submissions containing multiple paper proposals? Yes, assuming 3 or 4 papers are included; if there are only 2, you can either add a different proposal from your area or split the papers up as needed. However, for a pre-formed panel’s individual papers to show up correctly in the program, each proposal needs to be submitted individually, with a note in each abstract that the paper is part of a pre-formed panel, and who the other panel members are. All the proposals cannot be grouped together on a single proposal form; if they are submitted that way, please ask the Area Chair Coordinator, Kathleen Lacey, at klacey@southwestpca.org, to fix that situation in the database. Can I create special events for my area – like roundtables, screenings, and get-togethers? Yes. In the part of the database for creating papers and presentations, there is a drop-down menu (under “Type”) for area chairs and staff to use in creating such events . To make sure that such events show up correctly in the program, please notify conference staff about their existence when (or before) you submit your panels. Such notification is especially important if you need longer than the usual hour and a half timeslot, or if the event must be held at a special time (like a dinner for your area’s participants). Please do not use the “Special Event” type, as that is reserved for conference-wide events rather than area-specific events. Do any related awards exist about which I need to notify my participants? The conference provides information about the awards in acceptance letters, but we count on area chairs to remind presenters about them – especially in cases where a specific award is particularly relevant to an area’s subject matter. Check out our Graduate Student Awards page, and please encourage your presenters to apply. Do I need to email my participants with any information? Yes. Although the standardized acceptance letter contains basic information, please do email your participants at various points after acceptance – especially to remind them about deadlines for registration, award submissions, special hotel rates, etc. Can I present in a different area of the conference than my own? Do I have to present? Area chairs are not required to present at the conference every year, although most do. You can apply to present in any area you wish. Please let the other area chair know (in your proposal or in a separate email) that you are also an area chair, though. How long should I plan to stay in Albuquerque? We expect area chairs to attend the conference each year (except in emergency-type situations) and, optimally, to stay for the entire conference. However, you do not need to arrive early or stay late. Do I have to personally chair or attend all of my area’s panels? Especially in larger areas, you do not have to chair all of your area’s panels yourself – although the conference does expect you to chair at least part of them. For the others, feel free to email qualified presenters (presenters with prior conference experience, etc.) to ask if they would like to chair their own panels. Tell them that being a panel chair is a great opportunity that would look good on their CVs. Please direct your panel chairs to read our page of FAQs and Tips for Panel Chairs. Please also read that page for your own information. Regarding attendance, area chairs generally do try to attend most of their own areas’ panels (or at least show up before a panel starts) in order to meet their presenters, etc. At the conference, am I required to attend any meetings or events? The conference organizers always hold a business meeting for area chairs and staff. Area chairs are strongly encouraged to attend in order to find out important information. Attendance at other conference events, like luncheons and receptions, is optional. What should I do if one of my presenters emails me to cancel in advance? Immediately forward the email to the Area Chair Coordinator, Kathleen Lacey, at klacey@southwestpca.org, so that the presenter’s proposal can be removed from the appropriate panel in the database (or, depending on the date, added to the cancellation list on the conference’s Addendum). If the canceling presenter is someone who you had selected to be a panel chair, you will need to find a new chair (or decide to chair the panel yourself); again, please let Kathleen know about the change so she can make the necessary updates. If a presenter has a legitimate last-minute emergency (like a flight cancellation due to weather) and cannot attend, can I present his/her paper? If you wish. You do not have to do so, but it would prevent a gap in your panel and let the absent presenter feel that his/her work was not in vain. The presenter could either email you the paper (optimally with accompanying visuals) or fax it to you at the hotel. If this situation occurs, make sure to note on the presenter’s thank-you email that the paper was presented in absentia. Also, please let conference staff know about any cancellation immediately. What should I do if a presenter simply does not show up? If a presenter does not show up at the appropriate panel, and s/he did not inform you in advance about having to cancel, do not let that absence affect your panel. Afterward, check the cancellation list on the Addendum (posted on the bulletin board near the registration desk), just in case the presenter sent a cancellation notice to conference staff. If the presenter is not listed there as a cancellation, ask conference staff to check the registration list to see if the presenter paid and checked-in in person. If the presenter did check in at the desk, email the presenter ASAP (and perhaps call him/her via the hotel); perhaps there was some simple mixup regarding the panel’s time or room, etc. If so, you, the presenter, and conference staff can work together to find an appropriate spot for the presentation in another panel. However, if the presenter did not check in, ask staff to put the person’s name on the official “No Show” list of people to not accept at the conference in the future. Should I follow up with my presenters after the conference? Definitely. No more than a week after the conference ends, please send all of your presenters an email thanking them for their participation and inviting them to attend next year’s conference. If you know the date and location of the next conference (information usually provided at the area chair meeting), please include that information.